Douma Market Attack: Victims Dead Before the Attack? Note, Sept. 23: The following article relates the findings as they were at writing and for a short time after. I've questioned the findings below on photo time, in a continuing technical discussion here, and we've gone back and forth a bit, with real math entering the picture now. An updates section at the bottom will offer more refined time estimates and implications. Also the comparison time of attack estimate may have updates, which I'll add at bottom as well. This is a Syrian Civil Defense photo, posted at 2:52 PM here and, perhaps the first posting, the well-connected Douma Revolution channel ran it at 2:23. Corpse collection site 1: Men and boys, dirt floor (mosque?) courtyard, unwrapped then wrapped - canopy cover, west or southwest wall is blue screen or tarp, not a true wall. No gate at the corner. Considering 6 photos of this scene at different times (inset), there are at least 24 (probably 25+) bodies in the nearer row, and eventually at least 17 in the back row. So at least 41 total corpses are gathered here, likely the same 45+ seen wrapped in another similar courtyard (site 2, tile floor) a bit later. Here, five are clearly boys (considered here), and others might be. This seems to be the earliest photo, or among the earliest set of photos, of this corpse array. And this point there are perhaps the full 41 already assembled (not totally clear, but nearly all of them anyway) They're laid on a UNHCR tarp. 1) The bodies don't seem to display rigor mortis, which means they either died less than 2 hour ago, or about a day ago. 2) The blood on them all seem fairly dry. No one's pouring blood, and only the worst injuries seem to be smearing at all. 3) There are at least 41 bodies, just of men and boys, who already died from their injuries, stopped bleeding, and got fairly dry by the time of this photo, which we'll come back to as a crucial point. 5) They're somewhat smoky but not dusty. There was no rubble really to pull them from in this attack, and no indication they were under any. Quick gathering could happen of victims hit by bomb shrapnel in the open. But on this scale? They mostly show some combination of peppered and ripped-up a bit, bleeding from random spots, which is consistent. If as they say 300+ other men were wounded but lived, along with 200+ boys, it just means the areas were super-packed with males. Apparently this many were just hit precisely in some fatal areas (like execution victims are, by the way). 7) Again, this is a segregated scene, but in all other scenes and records, there's still no sign of any more than 3 women and about that many girls killed, to what seems about a dozen boys and about a hundred men. Were the females spared the way bomb victims sometimes are, randomly? Or were they "spared" the way Islamist war booty sometimes is? The opposition story laundered by Western media and "humanitarian" sources is quite clear the attack was by a Syrian fighter jet. But they provided no kind of independent evidence (video, etc.) and couldn't even get a remotely exact attack time. Human Rights Watch was told by a mix of activists and Douma local authorities, as their appeal for an arms embargo on Syria explained, "the four airstrikes hit the crowded markets ... at about noon." No specific time is cited. Others say vague things like mid-day. A later HRW report gives "the busy midday period," and AP reported "during rush hour." Syria Deeply cites "Hassan Taqi al-Din, a local media activist and Douma resident," who says he witnessed the attack and told them “It started at about noon..."
All of that is suspiciously vague. We might now have a reason for that. A clear and reliable visual time would be the one good measure, but that's still a little unclear. This has now been expanded into southwest views analysis. Brief summary: I've got a massive but blurred smoke plume seen probably around 2 PM or later and, at some earlier point it was four smaller plumes, like they say, from 4 blasts, (inset). That's harder to time, but from a similar view, decisive analysis pending. Sunlight is from almost behind the camera in both cases, as they face northeast towards Mount Snir (the sharper peak in both images) A working range for this photo is broadly 1:10-1:45 PM. Even with a time for either image, I'm not sure yet how to say how long before that the attack happened. How long does it take plumes of this or that size to form? We could estimate, roughly, an attack between 12:50 and 1:30. So this isn't clarified yet, but seems consistent in pointing to something about an hour off, and likely more, from literal noon. "About noon" would still be accurate, perhaps, but not very precise. It didn't sound precise anyway, did it? But it was an imprecision it seems everyone agreed on. Odd, that. Another way to get an idea is to see when people started talking about it, in a forum with lots of talking that moves quickly. Does it start at more like 12 or 1? I picked a few well-informed Twitter accounts to see when they first alerted their readers to news of the attack. Perhaps the best source would be DoumaRevolution, almost an official source it seems, and based in Douma, presumably. (All other related Douma accounts I checked posted nothing that day, having ceased all posting a while back - this is the active one). These and the below are mainly auto-translations, times given as local - Twitter's California time plus 10 hours (or shift AM to PM and subtract 2). 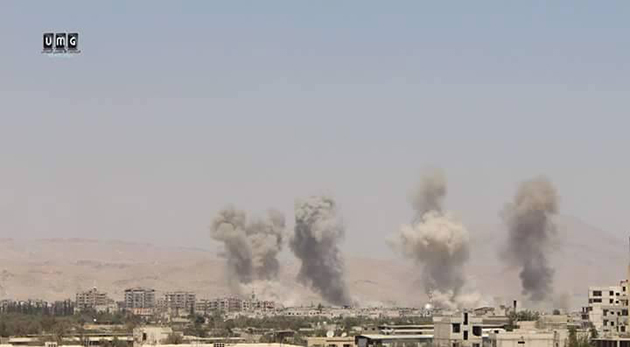 1:27 PM was their first news: 'Urgent :: #Douma coordination :: huge explosions rocking the city, together with constant overflights of warplanes in the sky ... ' They had an update at 1:28 and by 1:42 they knew "MiG flight now in Sky of Douma after targeting crowded city markets...' By 1:58 'dozens of martyrs and wounded hundreds in a new massacre committed by gang crime Asadi in the market ...' At 2:04 'more than 200 wounded and 35 martyrs...' first video shared at 2:19 and at 2:23 they knew of 'more than 55 dead...' Also at 2:23 the dead men and boys photo from above has its first posting here, (maybe anywhere?). At 2:36 they show a photo of market damage after the wounded were removed and the smoke cleared. They said nothing about this loud and obvious attack before 1:27. But maybe others had their own sources going back earlier? I can't say for sure, but all these I checked only come on board slower than that, not faster. LccSy (Local Coordinating Committees) only broke the news at 1:58 of 'scores between martyrs and injuries...' UK-based syriahr (SOHR) first reported at 2:26 on 'the martyrdom and wounding of dozens more ...' SyriaCivilDef ("White Helmets") broke the news to their followers only at 2:52, and Shaamnews only reported it at 3:23. So far I see no sign of the attack in anyone's awareness prior to 1:27. Let's say there may have been a moderate delay, or not, and keep it broad: this suggests an attack anywhere from 1:00-1:25 PM. That lines up fairly well with what the video, so far, seems to say. And in doing so, again, it softly contradicts the vague "around noon" claim from opposition sources. So again, when was the photo above taken? No later than first posting at 2:23 is pretty vague, when there's sunlight in it showing - to the right reading - exactly what time it was. To start, we don't have a location or wall orientation yet (but this right wall must face roughly south, probably a bit southeast). Compass direction to the sun - solar azimuth - is the best way to get time, but without exact place details it can't be done. The vertical angle, however, could be measured. Just on the surface we can see it's notably steep; this is mid-day sun, fairly close to solar noon. Vaguely then, it's at the same time as the attack, per rebel sources. And considering the above, this could even be before that later-than-implied attack. But that's vague. Let's move forward a bit. To be clear, I'm not certain I know how to read the three-dimensional angle of sunlight hitting walls seen at this angle to determine the sun's elevation. A straight reading of a line painted on the photo, rotated 5 degrees from the photo's rotation, first seemed to say 67 degrees. That would equate with approximately 1:30 PM. I asked Petri Krohn, who's at least more technically adept, if not a true expert either, and he weighed in with better tools reaching a quite similar finding (see here). Measuring from the blue cooler he found an elevation of 68.77 degrees explained it. The correlating time for that is 1:12:30 PM! We can see how less than 2 degrees difference equals 18 minutes time difference, so it's not good to be too exact with this just yet. But I looked again and decided, depending on the real angular calculations, 67, 70, and a few other angles seem possible, but I agreed 68-69 degrees is the best range. This gives a fairly narrow time range of 1:09-1:20 PM, or more broadly we could say 1:00-1:30. Again, it's alleged missiles hit "around noon," caused damage to the bodies of these and other civilians, and then these died, some instantly, some of them after struggling for some moments. We can presume they were pronounced dead, their bodies gathered from however many locations, and brought here (location still unknown), and we can see they stopped bleeding much and became fairly dry. All of that allegedly happened after the first missile impact, but before the time of this photo. The best attack time estimate of 1:00-1:25, plus this best-yet photo reading means the photo was taken anywhere from 25 minutes before the rockets hit to 30 minutes after. I think we can rule out anytime before - what would the photographer be thinking with no news to explain such a spread? It should look troubling enough just with such quick gathering from the attack minutes ago. There's clearly no way these can be victims of those blasts with anything like the above process unfolding, in 30 minutes or less. They must have died earlier, from something else, which their rebel handlers don't want to tell us the truth about. But here they would have bodies and cover story lined up perfectly ... if nearly simultaneous were perfect. But it's not. Is this a lack of "local coordination" or too much of it? Considering points 1 and 2 above about the lack of bleeding, moist blood, or rigor mortis, the victims might well have been murdered not just earlier in the day but sometime the day before. Even more clearly, that could hardly be an honest mix-up. This time reading also suggests the photo was held back before publication, it seems, for just about one hour (earliest found posting is 2:23). That might show worry about the image, and it might be the same worry shown by the man in the crop of it at right. Considering the situation, he could well be thinking "Oh crap, they're taking pictures already? Our rockets just hit and we haven't even announced the jet attack yet. This could go poorly." Much to their surprise, perhaps, the captured sunlight still looks the same even after a delay in releasing it. September 9: (see technical discussion). I think due consideration of shadow angles puts the photo time range about 20-25 minutes later than I thought. I may have overdone the correction, but I think considering all the details, still a photo no later than 2:00 and maybe earlier than 1:30 is still far too soon after a 1:10-1:25 attack for this photo to make the kind of sense alleged. September 15: I overdid the correction. The best answer, now at the same link and noted below, close to my first guess and keeps the point strong. As explained here, the best method was this: both outer walls cut apart and skewed to equal proportions - a square of width of one panel and one pilaster was marked, with relevant ground lines (edges of cooler and of shadow) drawn across from the right spots along each side of the grid - the rectangle of shadow angle was then measured at its true (app.) proportions, and the slant across it couple with clloer height was found to yield an elevation of 66.25 degrees, and a time of 1:36:30 PM. There's little room for exactitude here, so a fair range might be 1:30-1:45. That's between 5 and maybe 45 minutes after the attack. September 23/24: Petri Krohn offers a placement for the body collection point - for both this dirt floor scene and the later tile-floor scene. This is as I map it below, and helps consider transport time., It's not a major factor (a few hundred meters to one km, up major streets). Dying and drying time is what seems to be lacking. Although these images aren't clear on the point, there's also an east gate in this area, but I suspect IF bodies were brought in and not killed on-site ... it could easily be by either gate. The van shown above either came from the east, or backed into this spot. It doesn't matter except to suggest where they came from - in this case, likely not from the direction of the rocket attacks. A location allows an azimuth reading (compass direction to the sun). Using my ground grid for the above reading, the angle of shadow gives an azimuth 201.5 and so an earlier time of just about 1:10 PM. It's not exact either and seems early, but done right azimuth is far better than an altitude reading. Then I noticed the shadow I've been measuring going back a bit further, which points later (than 1:10). At the moment I say best guess is azimuth 207 = about 1:18-1:19 (or range 1:12-1:25). And I still suppose the photo is taken after the blasts and news of attack, but ... it can't be very much after. By the unrevised broad estimate range 1:00-1:25, this is anywhere from 13 minutes before the attack to maybe, in a stretch, 25 minutes after. AP reports (via New York Daily News) under the headline "Syrian government forces kill at least 18 in market blast: activists" "Activists" again refers to the SOHR, and also the LCC, calling on their sources in Shaar, "a rebel-held neighborhood" of Aleppo city. Rebel shells and rockets on government-held areas have been rather intense lately, killing sometimes dozens of civilians at a time. Once again, the rebels and sources - who should be ebtirely Islamist-leaning by now - come back with this market-centered accusation to shift the balance of propaganda back in their favor. The Britain-based Syrian Observatory for Human Rights said the surface-to-surface missile hit a market in Aleppo’s Shaar neighborhood, killing 18 and wounding dozens. It added that a wave of rockets struck the area afterward. The Local Coordination Committees said the attack by Bashar Assad’s brutal regime targeted a street with clothing stores. It said 20 died and more than 40 were wounded. * Al-Jazeera Assad forces kill dozens of civilians in Syria's Aleppo: "(SOHR's) Abdelrahman said 18 civilians were killed, but other sources told Al Jazeera that the fatalities were as high as 32." Byline claims "at least 32." The "brutal regime" targeted clothing stores - whose? Which rebel group runs this area? Are they terrorists? If so, they might do this themselves. If not, they'll surely have terrorist competitors in the area who would do it. Or maybe, as they say, the regime did it. But that's not fair to presume by recent precedent It has some similarities to the Douma market attack just over a month ago - an alleged jet attack that allegedly killed over 100, that appears instead to be done by surface rockets and as cover for people mainly dead before that. There's also the August 3 market attack in Ariha, Idlib province, where activists swear a jet bombed the market then deliberately crashed into it. In reality, that too was probably a surface rocket rebels have plenty of. Other jet claims that fell apart are among the precedents for these precedents, and there may well be other insights from the spectrum of alleged market attacks in Syria cataloged here, many blamed on jets or, more often, helicopters with their all-powerful "barrel bombs." And by precedent, the majority of the dead may have nothing to do with the blasts themselves, which serve mainly to launder whichever local massacre rebels want to shift the blame for on that day. .
Opposition Center for Documentation of Violations in Syria (VDC), linked to the LCC lists 24 dead this day under the note "More than 20 people killed due to shelling by Syrian regime forces using what so called "elephant missiles" on the civilian population areas." There were only 22 entries, so two were added since I first looked. All are dated 9-21, suggesting no later deaths among the critically wounded. These 24 are 17 men (was 18), five boys (was 2), one woman, and one girl. No repeat family names, but 12 adult males were unidentified when I first looked. Now 4 of those are named, some as boys. Names compared to other recent deaths in the area might yield interesting patterns, but I haven't yet. All are listed as from Shaar, no non-locals - some do include ages, if no other info. Boy ages: 10, 13, 16, 17, 17. I'm guessing men cluster on the other side 18. The girl was aged 10, the woman aged 50. All females in between these ages were miraculously spared from death? Another Arabic list I found has only 15 entries, at least some matching names, most with ages. (note: VDC entries can be switched to Arabic for checking: type /ar in the url were /en is and reload). This has victims from two districts/neighborhoods: 6 from al-Sha'ar and 9 from al-Midan Children ages shown: 12, 16, and 16. This says three unidentified dead from Midan were of family al-Basha ( الباشا ) , first names unknown - VDC's list has no such name, but one is close: one is identified Nawaf Housein Ibrahim Albaha ( البها ) age 17. I'm guessing this is what they meant, and 2 more of the unidentified share his name. * There was at least one photo I saw of a small rocket impact mark on pavement that could easily show the firing direction. War News Updates reports 27 civilians were killed and dozens wounded "after a Syrian army fighter jet crashed into a marketplace in the Syrian town of Ariha in Idlib province." Citing Reuters citing locals, they say civilians were mainly killed, and "The plane had dropped a bomb on the main Bazaar street at low altitude only seconds before it crashed," Ghazal Abdullah, a resident who was close to the incident, told Reuters." "The plane had dropped a bomb on the main Bazaar street at low altitude only seconds before it crashed," said Ghazal Abdullah, a resident who was close to the incident. The Observatory said the jet was not shot down. Ariha, Idlib province was recently conquered by the al-Qaeda-led "Army of Conquest," with the most overt Turkish assistance yet, a bit after Idlib city. As such it will be another Islamist occupation area like in Douma. All the reliable sources are dead or fled, if more recently than in Douma. The opposition VDC (Douma-based, co-founder long-ago abducted by local Islamists, or...) lists 34 dead in Idlib this day under the note ""Massacre of the Jet, "several people martyred due to the falling of a Meg Jet on the local market in the city." 32 men, 2 boys, no females (listed). Generic Videos, not reviewed: 1 - 2 - 3. Suicide Crash? By WarNews' report, No shooting is mentioned in the crash, the SOHR specified the plane was not shot down ... original source forthcoming - SOHR reported that the jet was not shot down, so ... all damage should be from its bombs or, less-obvious to me ... are they saying the jet bombed the market then crashed in without being shot down? The SOHR may be hearing - from their remaining (Islamist) sources in Ariha - that regime jets are suicide-attacking markets now, just to kill civilians and make an expensive and illogical new case for a "no fly zone." As Reuters said, "the observatory said the jet was not shot down." I looked for their own words on it, but it seems to be something they said to reporters, not in their own dispatches. Between their Facebook page (with an unusual blank span that day, with thin days before and after) and their website, there's no mention of this aspect of implied suicide attack. It's not mentioned if it was shot down or not. But Reuters says they did say this, so they probably did. Was it retracted or just not repeated? Later: "it rose to 34 they are three children under the age of 16 and a citizen woman and 25 men over the age of 18, and five unidentified men the number of deaths who have died as a result of warplanes bombing and the warplane crash on the vegetable market area in ​​the city of Ariha, and the number of deaths is likely to rise because there are more than 60 critical wound and others are missing." VDC has only 34 with that note, no rise, but divided 32 men and 2 boys - implied, one boy and one woman listed as men - but there are no apparent female names. One the 4 unidentified with two identified maybe? Repeat family names include Mahloub, Badawi, etc. Getty Images/Anadolu Agency has a photo (detail at right) to support the claim "a Syrian regime warplane crashed into a market in Syrias northwestern Idlib province, according to a local civil defense official," an event with no mentioned shooting, but 35 civilian deaths. * Engine and other wreckage all together at the curb. And so, in this earlier precedent for jets attacking markets, there was proof. Some flag-marked jet wreckage, next to melons. It looks arguably natural how it came together, but ... to me, the metal appears to be quite weathered, having spent some time outdoors in this same crumpled state. From the close-cropped photo, the size of material appears easily transported and planted. If there's much more of it, maybe not. If this jet was shot down long ago and had its wreckage saved as a prop and later dropped here to prove jet-on-market action ... what does that say about later alleged jet-on-market attacks? weathered bodies? Maybe dead 2 days already, placed in a van, now scattered realistically at the blast site? Other bodies seem clearly fresh in their injuries - why is one man injured mainly beneath pre-exisiting bandages torn open? Etc. It was one month ago now in the Damascus suburb of Douma that, activists say, a Syrian Arab Air Force fighter jet deliberately fired missiles into three crowded vegetable markets at mid-day. 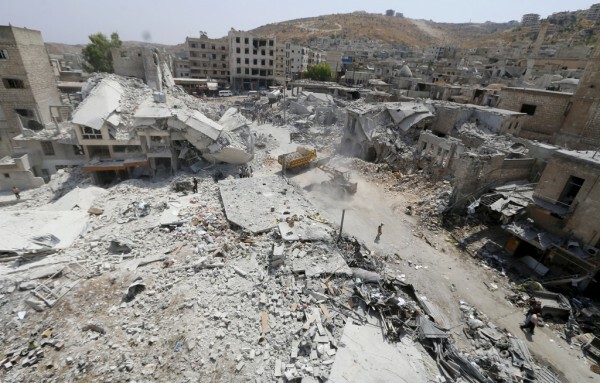 The strike reportedly killed at least 112 civilians and wounded hundreds, without hitting a single rebel fighter. It was a popular theme on Twitter, some using the hashtag #Douma_Exterminated, that the crime was being ignored by the world at large (see mash-up below). Some commentators said the same, like the one at Middle East Monitor who said that "Assad’s regime committed its crime in light of complete international silence," which applies to all of "Al-Assad’s massacres against Syria’s land and people." Another, at Daily Sabah, lamented "the deafening silence of the world over the massacres is growing every day and slaughters in Syria hardly become news unless their perpetrator is ISIS." But of course that attack was pretty big news; anti-government activists, political and UN leaders, and the mainstream media all spoke up - in fact, unusually loudly - about this supposedly obvious fighter jet massacre. Public protests and candlelight vigils were held around the world to highlight the horrors of Douma. Human Rights Watch HRW) used the furor to call for an arms embargo on Syria, and underlined the point with a same-day missive comparing it to a market attack in Bosnia almost exactly 20 years earlier that triggered a NATO air war. Crime writer Robert Lewis, who also latched onto the Bosnia angle, is in fact more on the mark to say "the “international community”, as the West and its satellites are fond of calling themselves, was quick to voice its outrage, as it has been throughout its five year campaign for Syrian regime change." He cites a few prominent examples as reminders; the market attack "underscore that the Assad regime has lost legitimacy," one typical comment says, and must surrender to some ill-defined "transition." It's clear that by "silent" the activists here meant "the world" was not yet bombing Syria to "stop Assad bombing his people." That's not silent, it's inactive. Or more accurately, the West and its allies are not as decisively involved as they were in, say, Libya, to stop the supposed killing of protesters. That's not semantics, just the rules that keep language meaningful. But these are increasingly optional in a world wracked by the well-intentioned wars and humanitarian instability driving waves of refugees around the world. Also optional, at least in the case of this alleged market attack, is any effort to investigate the claims and establish the actual truth. None of those pillars of the "international community," so quick to blame Syria's government, has conducted or called for a proper investigation. Instead, they have seemingly agreed to already know just what happened. There is, in fact, a deafening silence from "the world" over the details of the attack. Nonetheless, some have been engaging in unofficial investigations from open sources. Eric Draister's early article The Douma Market Attack: a Fabricated Pretext for Intervention? (Counterpunch, August 21) was clearly hungered for and widely-read. For myself and some others, this has become another serious project now getting some useful results. This article is an attempted summary of our findings at one month in, relating points explained in Monitor posts linked here and at the masterlist, or at A Closer Look On Syria's subject page and talk page. It's hoped this will help clarify some details. For example, perhaps the biggest limitation Draister's article and others in a similar vein was the overriding suggestion there was no massacre, and the victims were rebel fighters killed in action. Those who latched onto this notion have naturally failed to raise any alarm bells over the laundered rebel massacre of civilians this might well be. Masses of produce, food carts, and stalls are seen in two damaged areas, and flipped vehicles and building debris are seen at the other. So we can say markets were hit by something, not just some rebel base nearby, as some intervention critics have speculated. 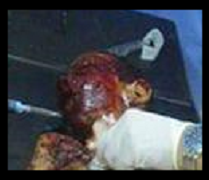 Draister's report cited just one video, at the el-Hal market, showing dead bodies in situ. 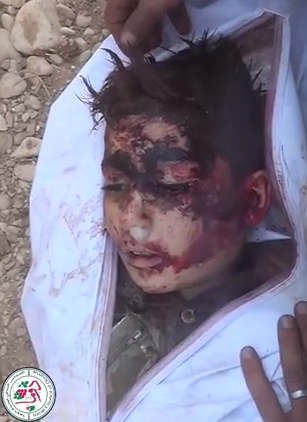 But at least one other unplaced video is more convincing, showing a mangled boy, some wounded, and partial remains. But still, we have a similar picture; at least a handful of dead and some wounded - mostly younger men and older boys - seen at each spot. We know now there were multiple spots, and there were probably many more wounded and more killed between the sites. But it doesn't seem that any sizable buildings collapsed here, and with open-air victims alone it still seems doubtful it was anything close to the claimed 550 injured and 112+ dead. Attack Time: After the Victims had Died! All later accounts agree on the vague attack time of mid-day, or around noon. HRW heard from several sources, and all they had to go on was "about noon." But by initial Twitter messages, there's no sign of awareness before 1:27 PM, suggesting it happened shortly before that. By the visuals cited, attack time isn't precise but around 1:00 at the earliest, maybe as late as 1:30. A best overall estimate, pending better clues, is 1:15-1:25 pm. The implied process occurring in that time frame is simply not plausible. Those who were actually killed in the blast were obviously killed at that time. But this significant portion, at least, is not included in that. This could stand some double-checking and refinement, but it appears to be a smoking gun to prove that the victims were already dead, from something else, before the cover-story rockets were even fired. Relevant to the bulk of the dead or not, there were mid-day blasts at the markets. A Mig jet attack was claimed and widely accepted as the cause, but supporting evidence remains entirely absent. It seems no one at all filmed the jet before, during, or after its purported attack, and there's no contrail video. As far as I've seen, no one has shown or even claimed any jet-connected munition debris. And as noted, all sources in fact agree to not even specify the real attack time. One thing they can rely on is an alleged market attack in Ariha, Idlib province, with supposed proof. It was almost two weeks before the Douma massacre, on August 3, when a Mig allegedly fired into the public market at mid-day, then crashed into the market, without even being shot down. 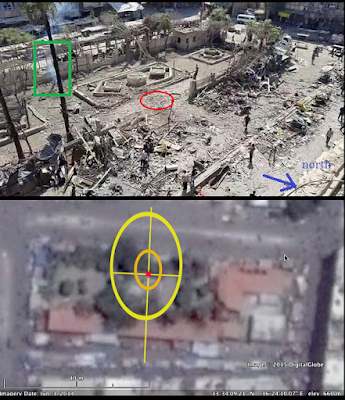 That sounds like an alleged suicide attack, another and expensive way for "Assad" to argue for a "no fly zone," illogical but proven by jet wreckage - possibly weathered (planted) - and with holes in it anyway, that was shown to the media at the site (see here). 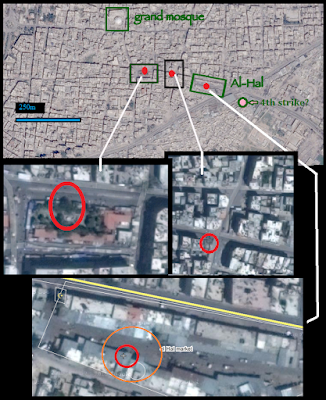 Activists report that thermobaric or fuel-air explosive (FAE) weapons ("vacuum missiles") were used in Douma/ This appears consistent to us; tall, fast-rising plumes quickly cooled and started drifting west. 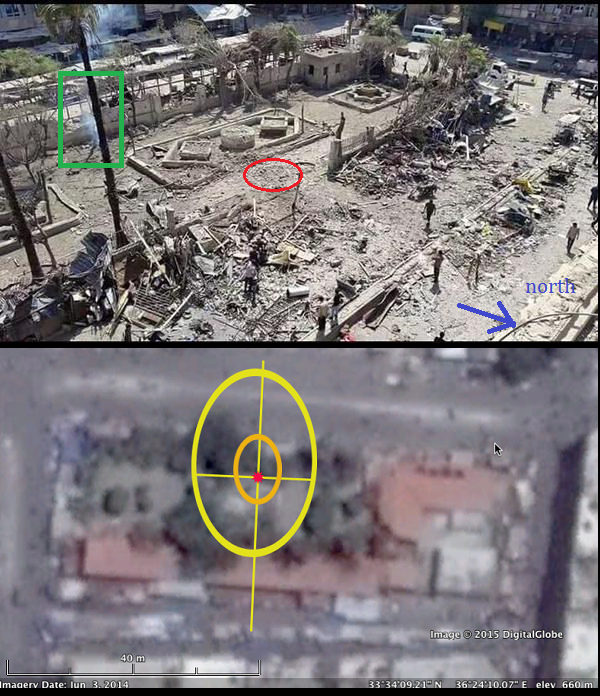 A tall tree was left smoldering (see photo below, green box) They left apparent blast areas 30-40 meters wide, which can help deduce the weapon volume, and tell if it's even plausible that a jet fired any of the four. Interestingly, there's an apparent arc of attack in the three impacts, as mapped above and again at right. Arcs of attack refer to surface warfare; it would be unusual for fighter jet hits taken on different swoops to wind up with such a pattern. That arc might suggest a surface rocket firing position to the south-southwest, range unknown. The distances between the three placed impacts are roughly equal, and the plume photo suggests all four are equally spaced. Considering that and the pattern of the other three, the unplaced fourth hit will likely be in the same arc as well, so about 120 meters east-southeast of the last one (hence the pink dot continuing the arc, as shown). What's there seems like it could be a square version al el-Hal market, as shown above. Here, red is known and pink unknown, with lines suggesting possible angles for each impact (that depends on distance to the convergence point, and vice-versa - these impacts are worth more study). Note 9/24: Petri found the video of impact 4, at a large steel-framed building just like the one at the pink dot, more in the middle of its roof. See comments. The one impact that, so far, can be read clearly for direction clues is the furthest west, and would be from the most southern direction. The impact dynamics at the park market clearly suggest it was fired from just barely west of due south, about 182.5 degrees. 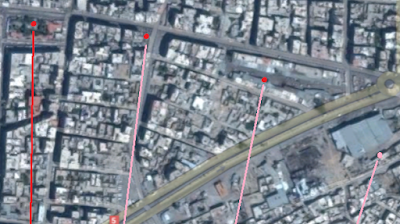 That line points to Mesraba outskirts or Beit Sawa (2.5-4 km out). The incoming angle may be fairly steep (not a massive forward trajectory), so fired from relatively near. 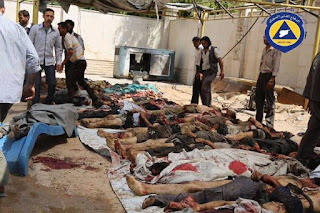 The ostensibly civilian victims is what the high-profile protests were all about; Assad's jets killed more than 100 civilians. And that included women and children - but just barely, like a token number. As Draister and others (like SyrPer, myself) noted in the first days was how opposition lists showed the attack killed, almost exclusively, adult males. This has to be refined, slightly. First, by comparing lists, we've established perhaps 125 listed victims, with others left off. For example, there are still zero girls listed, to the four so far seen dead in images. There are at least 12-16 boys total between lists and images, mostly older boys, with at least two wrongly listed as men. And so there are about 20 children total, and 3 women as listed, but primarily the alleged jet attack killed about 100-115 adult males. The second-biggest segment - older boys - are also men by Islamist reckoning, which now prevails in Douma. Douma's local council reported, as HRW passed on, "that the August 16 attacks killed a total of 112 and injured 550 civilians, 40 percent of them children, as well as 8 women." 8 wounded plus 3 dead equals 11 women effected, out of 662 total, at a total of 3 vegetable markets. This remains unnatural and begs for an explanation that hasn't been clearly offered. However we should note that, whatever caused this imbalance, it's not special to this case, but standard across all warplane shelling and all market attack deaths. The August 3 suicide attack mentioned above killed 34 men, 2 boys, and no females by VDC records. By the same, out of nearly 1,000 civilian market attack fatalities, 92% are male, and of those about 89% are adult (see here). This aspect of the August 16 attack has been a core mystery and cause for question, and deserves some careful thought. Four strike areas means more room for victims - perhaps enough room that the numbers claimed make sense. Another thought that's logical, if not necessarily true: in a strained medical system, saving the lives of children might be top priority, and with some 400 or more men injured or dead, they tended to die untreated. 1) Only men and older boys - but not rebel fighters - do the market shopping. Mostly. 2) The excess of men are from a large batch of rebel fighters killed in combat or bombing raids, and perhaps laundered by inclusion with a smaller event at the markets. 3) the excess men as well as the boys, females, anyone not killed in the rocket attack were culled hostages, possibly religious enemies, with females "spared" (kept as chattel), names made up with mass grave erasure, "Assad" blamed and a "no-fly zone" called for. As mentioned above, it seems at least 40 victims were already dead before the alleged jet attack even occurred. The clear alternative is those with the false cover story, or allies of theirs, had in fact killed these people for unknown reasons. There are some strong supporting clues pointing the same way. As noticed early on, at least 95 and perhaps all of the victims were buried in mass graves, instead of the usual family-managed individual burial. Activists said they had to forgo regular burial and somehow even prayers, on account of government snipers who apparently shot at individual funerals and people praying (?). Yet they managed to dig one grave deep enough to easily bury a bus in. As Eric Draiter noted "a real investigation into this incident would probe into the use of mass graves for the purposes of hiding key information, namely the identities of those killed." It seems likely the victims were captives, with family either captured as well or otherwise afraid or unable to reclaim the body. In such a situation, the provided victim names are questionable. However, it's odd how in alleged market attacks in Douma, several family names keep resurfacing, as often happens in other cases that seem to be laundered rebel massacres. Consider the unusual case of the al-Tout family, with only 26 "martyrs" of this name listed as killed in the whole war, all but one from Douma. Yet among those are a boy and girl killed in a June 30 alleged market attack, and then in the August 16 attack, a man and a boy listed as a man died. The boy, Khaled al-Tout, is shown at right; he has a badly burned face, and was left exuding mucous, likely from the flammable material. Then 3 more al-Tout children and no adults died on August 30 - a boy and 2 girls, "due to the shelling." Considering how sharply that differs from the usual man-heavy pattern, this acute deviation must have some reason. Images of the day's dead seem to show a disturbing segregation of death types beyond the means of a fighter jet's missile (see Victim Analysis and sub-posts). Men and older boys appear roughed-up, peppered by shrapnel or bullets, and are often smoke-stained - so they look like possible shelling victims, but with light and seemingly non-fatal damage. Some seen on video may have suspect throat injuries. Many men have had their faces lightly burned and many have had their pants pulled down (see image above). Some boys have their faces burned even worse than the men (Khaled, above, unidentified, below), but their pants stayed up. Between these signs we have evidence for possible torture, attempts to conceal identities, disrespect to the dead, and age differentiation. Note 9/24: The thermobaric/FAE possibility still needs considered carefully. It kills differently from regular shelling, and involves flammables, but may not fit what we see. Goal for two-month update. Women are less clear; only one of the three is seen, with nothing visible but for an intact face, and some kind of bloody upper body injury. Three girls and a younger boy seen in different photos and claimed as victims do not look at all like dusty and tattered shelling victims, but all seemingly died from acute head injuries, in at least one case consistent with a massive blow from a sword. One special case may provide a picture window into a chilling aspect of what really happened that day in Douma. A lightly-circulated photo shows a surviving victim of some August 16 "massacre" there. However, the image is clear (but explained here anyway) this preteen boy is no bombing victim. As shown in the crop here, his face is discretely burned raw. Left off is how his body was pulled violently and came apart slightly at the knees and totally at the elbows, with no other marks in between these horrifying signs of seemingly deliberate torture. He was most likely tied between two trucks that drove opposite ways and pulled him apart. And then they burned his face worse than anyone's, but he didn't even die just yet. As one report from the day after the massacre put it, "UN officials, including peace envoy for Syria Staffan de Mistura, expressed horror at air strikes" on Douma's markets. "Horror" is always quoted, but no one shows just who used that word. But Mistura and the other officials cited didn't even know the half of the hell that is Douma, where everyone is said to love the occupying Army of Islam and its al-Qaeda allies. In fact, their supporters say, that's why Assad bombed the markets. It was a jet attack on Islamism itself, they would argue, that tore men away from families and tore the arms away from the one boy, that spared females, burned faces, and caused most of its deaths before even being launched. These are some of the mysterious plagues the people of Douma live under as "the world" continues pushing for regime change in Syria. But the only thing Mistura and his ilk mention just has to further that same goal; "killing almost one hundred of its own citizens by a government is unacceptable in any circumstances," as we can see even if it's untrue. In saying this, he helped absolve the largely foreign - but non-governmental - terrorists that are most likely responsible. Presumably, he did that unknowingly. How much else do these officials do in this presumably unknowing manner? And what role has that had in contributing to the often-horrifying death of hundreds of thousands of people since the regime change campaign began over four years ago? last edits (add Jeesi 1/20/15) Dec. 12. In looking into the infamous alleged fighter jet attack on the Douma market, preceding incidents (plus a few later ones) seemed worth looking into. And then it seemed worth a total overview of attacks on souqs (public markets). I started this, as I often do, from perusing the martyrs database of the Douma-based Center for Documentation of Violations in Syria (VDC). Case-by-case, for some cases, I'll expand to other sources and analyze a bit. Patterns repeat, etc. (in progress). Warplane shelling: Each alleged victim of this is one more argument for a Libya-style "no-fly zone" over Syria, and there have been a lot of them. Besides a presumably larger number wounded but managing to survive, the VDC currently lists 18,866 civilians killed by warplane shelling (this includes jets, helicopters, anything airborne). This includes Israeli and US/coalition strikes, but in small numbers - 17,000+ will be by "regime" forces, allegedly) That's ostensibly collatoeral damage in the course of targeting militants, but only 933 non-civilians were hit, as VDC records it. That nearly 20 civilians died to every fighter could make one wonder if the government is trying to kill civilians, as activists often suggest. Of these nearly 19,000 dead civilians, there are 11,255 listed as men, 3,089 as boys. 2,706 as women, and 1,816 as girls. Warplane + Market: the relevant part - all warplane shelling with "market" in notes = 525. Four of these are non-civilians. Of the 521 civilian dead, 438 are men. 40 are boys. Surprisingly, by 2015 standards, 29 are women, and 14 are girls - but only one girl so far in 2015. Including warplanes and all other relevant causes + market = 978 civilians killed. For those hung up on the all-male aspect for the August 16 attack (includes me), it's standard. 803 market victims are men, 97 are boys (so exactly 900 mare ales, or 92% of the total), and they list 55 women and 23 girls killed. Other + Market: There are 457 minus warplane - and the total is off by one (not sure why). Causes: shelling, explosion, and for good measure, shooting - mainly by the "regime," they say or imply, in presumably deliberate attacks on markets. The fatalities as listed have been 365 men, 57 boys, 26 women, and 9 girls. Other Other: 74 civilians executed etc. with "market" in notes - mostly found near a market. These don't count. But there may be an odd case or two in there. No cross-over between market and "Chemical and toxic gases" or "other". Gender note: Across the board, the gender distribution is notably lopsided for usual market behavior in the Arab world, and it's cumulative over the whole conflict (at least from late 2012, but mainly in the last year). Market shopping is usually a task for women, but these of course aren't usual times. Is this in fact market behavior in Islamist areas (almost universally where theses attacks are alleged)? Only men and older boys - but never fighters - are allowed to shop in any number? The VDC and allied sources like the LCC sometimes do not have female victims reported to them right away, and list them later if ever. But that doesn't seem common enough to explain this, and at least some cases are supported by images of about that many men and few if any females. So, is it some low quota on females in public? Or is it the chivalry of the munitions that explains their being spared? 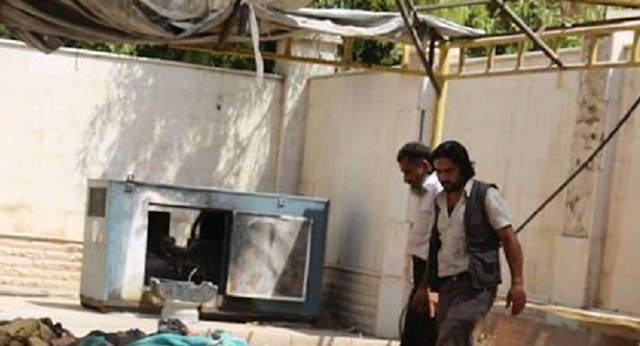 Or ... are these mainly laundered rebel fighters, as many speculate, perhaps mixed-in to real market attack death toll? Or ... is someone killing the men and keeping (most of) their females, and just blaming made-up or exaggerated market attacks? Or is it, as seem likely at this scale, some mix of these causes (the more logical ones)? This is an odd and small but existent category. In case it grows, here's the VDC's list for regime forces fatalities (a different database from martyrs) with "market" in the notes. At 2 entries long, both can be considered here. 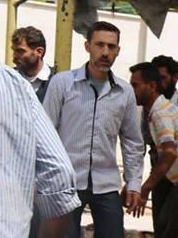 Both are adult men, status: Regime's Army, rank: Civilian (whatever that means - unclear. Sometimes it seems to mean Alawite civilian). * Mazen Abdullah al-Swedany Province: Daraa. Area: Nawa status: civilian.Photo, Facebook link. Date of death 2013-11-03. Martyrdom location: Damascus: Zablatani. Cause of Death: Shelling. Notes: due to FSA shelling on Hal market. So we can see in the records that anti-government forces have attacked markets ... and killed exactly two "regime army" civilians. Neither of these documented violations caused any martyr-type fatalities, (no crossover with the incidents listed below - Bab's market was hit by the regime the same day as Hasaka's was hit by ISIS, but they're far apart places, so it's ... a coincidence?). And so, it's on to the 978 civilians ... or those killed by Assad, or ... the ones their rebel sources insisted were not killed by any stripe of rebels ... as far as I know. Whatever. On to the "martyrs," nearly 1,000 of them. Scanning the big VDC list of 525 victims of aerial attacks on markets and 457 other market victims, this is an approximately complete chronolgical list of incidents/dates/locales. Links and details will come in sections for certain cases anyway (especially for those already covered). 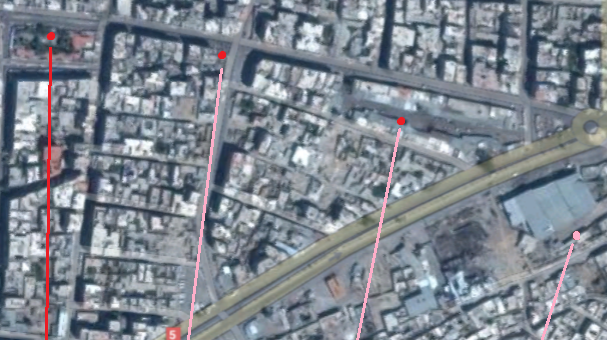 Aerial ("warplane") attacks will be marked W. The August 12, 2015 Douma incident is actually not included by VDC in that total, and is added by me based on market connection (see section below). * Homs 2012-05-15 Shooting 1 man "Due to his wounded that he got in an explosion in Tabaqah Market"
118 listed (110 men, two died later) ... see masterlist for lots of details and analysis. 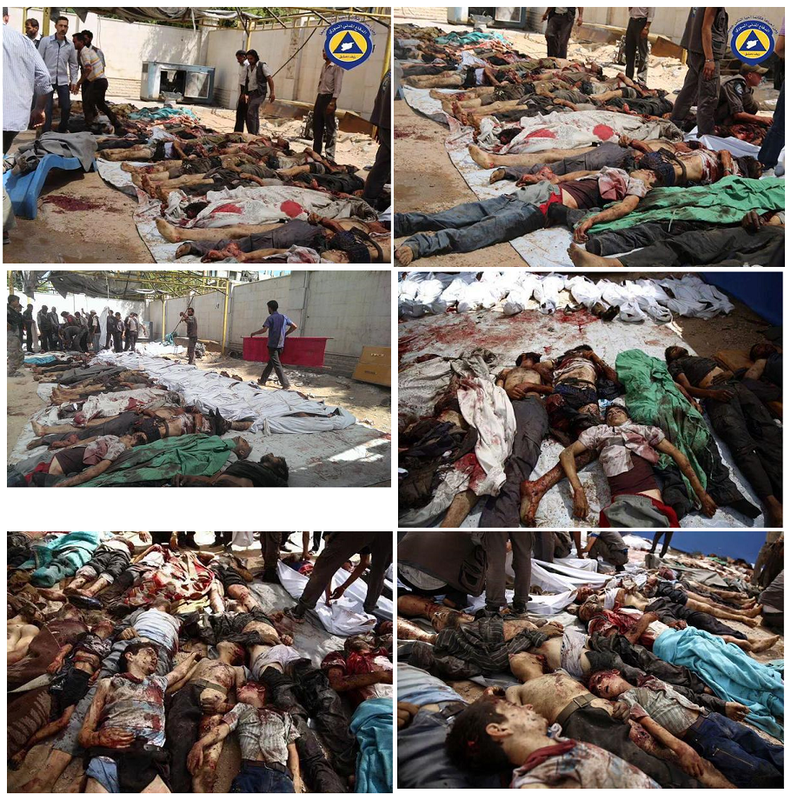 Same day, 7 men from Daraa al-Balad plus 1 next-day "Due to helicopter shelling of the local market with explosive barrels"
VDC lists 34 dead under the note "Massacre of the Jet, several people martyred due to the falling of a Meg Jet on the local market in the city." 32 men, 2 boys, no females (listed). Generic Videos, not reviewed: 1 - 2 - 3. Ariha, Idlib province was recently conquered, well after Idlib city, and will be another Islamist occupation like in Douma. War News Updates reports 27 civilians were killed and dozens wounded "after a Syrian army fighter jet crashed into a marketplace in the Syrian town of Ariha in Idlib province." Citing Reuters citing locals, they say civilians were mainly killed, and "The plane had dropped a bomb on the main Bazaar street at low altitude only seconds before it crashed," Ghazal Abdullah, a resident who was close to the incident, told Reuters." No shooting is mentioned in the crash, but presumable. Getty Images/Anadolu Agency has a photo (detail at right) to support the claim "a Syrian regime warplane crashed into a market in Syrias northwestern Idlib province, according to a local civil defense official," an event with no mentioned shooting, but 35 civilian deaths. The SOHR reported that the jet was not shot down, so ... all damage should be from its bombs or, less-obvious to me ... are they saying the jet bombed the market then crashed in without being shot down? The SOHR may be hearing - from their remaining (Islamist) sources in Ariha - that regime jets are suicide-attacking markets now, just to kill civilians and make an expensive and illogical new case for a "no fly zone." VDC lists 12 dead - unusually gender-mixed, 7 men, 3 boys, 1 woman, 1 girl. The girl and one boy are named al-Tout, names of a boy and man killed in the August 16 market attack there. The names Seyroul and Shehab at least also appear in both attacks. 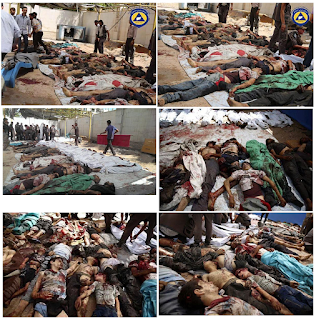 Wadi Barada, Damascus Suburbs 2013-10-25 Explosion - 152 dead - 132 men, 17 boys, 2 women, 1 girl. "Dozens of civilians were killed as a result of a car bomb explosion in front of the "Osama bin Zaid" mosque, in Wadi Barada main market, after the "Friday prayers"‬" Location: northwest edge of Damascus. It killed 132 men and 20 others, besides an unclear number who presumably survived. This strange case, covered here at ACLOS, has strange link to another mosque car-bombing nearby a month earlier, an odd victim who allegedly died in the second one a month after being injured in the first- or was he the bomb-maker? Further, by victim names and locale, these both might connect to the Moadamiya portion of the August 21 Ghouta chemical attack (see here).